We Heart It has quietly amassed 20 million active monthly users and given Pinterest some competition. 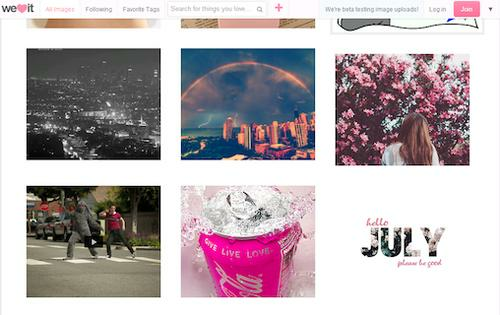 We Heart It is a social site focused on photos, much like Pinterest. However, unlike it's older and bigger rival, We Heart It has that marketer's dream of a 16- to 24-year-old core base and US$8 million in investor funding. The site says it's adding a million new users a month. We Heart It has quietly amassed 20 million active monthly users and given Pinterest some competition. For a company that was incorporated two years ago and hired its first CEO just two months ago, We Heart It has made a lot of progress. "We've been very quiet. We've been focused on the product and our users," said CEO Ranah Edelin. "Facebook is great. I use it all the time. I have a lot of respect for them but this is about defining who you are and expressing who you are in a visual way. And that can make it easier to understand someone." We Heart It is built to enable users to collect and share images, which sounds a lot like Pinterest, a pin-board-style service that also allows users to create and share collections of images. Pinterest, with about 50 million active users, is known for having its older users who are interested in do-it-yourself projects and images focused on gardening, fashion and crafts. We Heart It's younger users are more interested in telling the world about themselves through images of things they're interested in, says Edelin. "You can follow people, but it's not about connecting with your friends," he said. "Facebook is about connecting with the friends you know. This is more about following people you have shared interests with. If I'm interested in scuba diving or traveling, I'm going to follow people interested in the same thing." Brad Shimmin, an analyst at Current Analysis, said younger users especially are increasingly into sharing images, perhaps more than written posts, on social media. "Look at how somebody uses Facebook compared to a site like this," said Shimmin. "You are telling people who you are through this service without writing a 4,000-word manifest. What strikes me as compelling is that some people may not feel comfortable talking about what they had for breakfast but they can tell people who they are, in a very intimate way by associating themselves with things they like." We Heart It is all about what things, interests, causes or hobbies people want to be identified with. It's kind of like a visual ID, Shimmin added. "Here you get rid of these contractual social obligations," said Shimmin. "This is more emotional, I think. It's more about following images than people." We Heart It youthful base, and the fact it's adding a million new users a month, gives Pinterest something to worry about, said Patrick Moorhead, an analyst at Moor Insights & Strategy. "I had not heard of the site, but my teenage girls had," he said. "Social media is like TV channels, in that as long as it is very different and has enough scale, it can pull users away from the largest sites. This is very different from Pinterest, which has drawn an older and more diverse crowd but 20 million active users is impressive." Pinterest needs to figure out how it could draw in the 16 to 24-year-old demographic, Moorhead added. Shimmin, however, said there's plenty of room for both Pinterest and We Heart It to succeed with their own user bases. "The market for social network destination sites is phenomenally large and vibrant and able to support a wide array of audiences," said Shimmin. "I think Pinterest and We Heart It have a different philosophy about them and I think the market can house both. You don't' have to pledge your allegiance to one or the other." <<p>Sharon Gaudin covers the Internet and Web 2.0, emerging technologies, and desktop and laptop chips for Computerworld. Follow Sharon on Twitter at @sgaudin, or subscribe to Sharon's RSS feed . Her email address is sgaudin@computerworld.com.